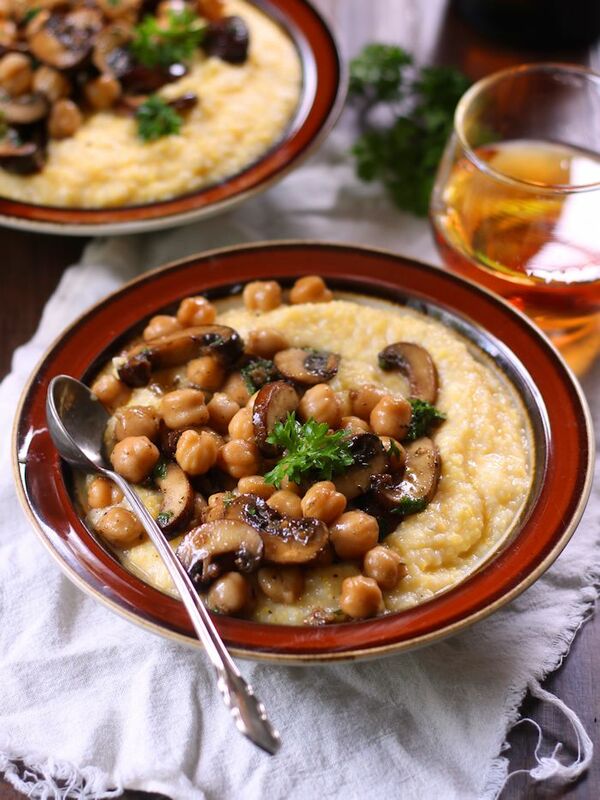 This vegan mushroom Marsala is made with tender baby portobello mushrooms and chickpeas simmered in a garlicky Marsala wine sauce and served over a bed of creamy polenta. Here’s one that’s inspired by a dish I’ve never actually had. I waited tables at a small handful of places when I was in college, and at least two of those places served chicken Marsala. Now, this is going to sound weird, but despite being a vegetarian, I was always really intrigued in the dish. Okay, maybe not the dish itself, but the sauce. It just smelled really good. All of those restaurants I worked at would hook me up with a meal if I worked a long shift, so I’m not sure why it never occurred to me to ask if I could have the sauce over pasta or something. In any event, I never got to know what that delicious smelling sauce packed with shiny little mushroom bits tasted like. It just recently occurred to me that I needed to find out, and to do that I’d need to create my own version. This is really a mish-mosh of eighty or so recipes that I perused in various cookbooks and online, since I’ve never actually had Marsala sauce before. I’m not sure how close I came to the mark, but it was so delicious that I’m going to just go ahead and proclaim success. One thing I did differently from all the recipes I scoped out was to include garlic. Not a single one called for garlic! I distinctly recall the Marsala sauce of my younger years smelling garlicky. Maybe I just remember it that way because I really like garlic, but whatever. I went and included it, because garlic is good in just about anything, except maybe chocolate muffins (I checked). It was good here. Since we’re skipping the chicken part of chicken Marsala, I figured we ought to add a little something for protein, and chickpeas seemed perfect. The Marsala dishes I served years ago usually came with a big scoop of pasta, but I love the combination of savory mushrooms and creamy polenta, so I went with that instead. I’m sure this would be good atop pasta, so feel free to sub pasta for polenta if you’d like, and be sure to let me know how it works out. Coat the bottom of a large skillet with oil and place over medium heat. Add mushrooms in an even layer. Cook until mushrooms are lightly browned, about 5 minutes. Add garlic and cook 1 minute more. Add wine, lemon juice, sage, salt and pepper. Stir a few times and bring to a simmer. Lower heat and allow to simmer until sauce is thickened and syrupy, about 10 minutes. Add chickpeas and stir a few times. Cook about 1 minute more, just until chickpeas are heated throughout. Remove from heat. Stir in parsley. Place polenta grits, 2 cups of water, milk, salt and pepper into a medium saucepan and stir a few times. Place over medium heat and bring to a simmer. Lower heat and allow to simmer, uncovered, for about 10 minutes, stirring occasionally and adding a bit of extra water if mixture becomes too thick. Remove from heat and allow to sit for 5 minutes. 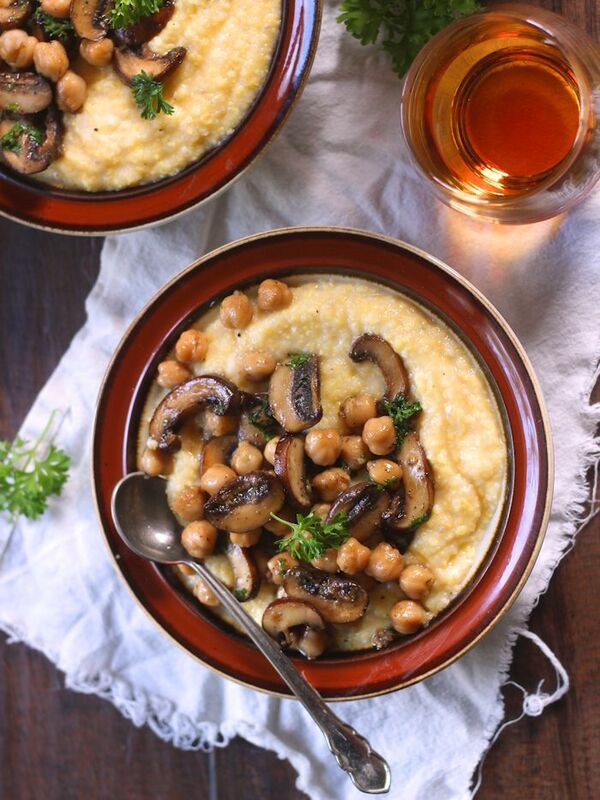 Divide polenta among bowls and top with mushroom and chickpea Marsala. I am craving some polenta right now! Ah! so good! This looks so amazing and comforting! What is the difference between polenta grits and regular grits? I’m not sure I’ve ever seen polenta grits where I shop. Alissa, We made this last night. As we’re not vegans, we upped the water for the polenta and substituted a tablespoon of butter for the cup of almond milk, so the creaminess was still there. I sauteed two heads of red kale in a little sesame oil and served it on the side, which, given the whiteness of your recipe, transformed the plate into a totally beautiful and delicious dinner. Thank you for the inspiring recipes you bring to the world. As soon as I saw this…I fell in love! I’ve had chicken marsala and always loved it before becoming a vegetarian. Yup, the sauce is crazy delicious. I cannot wait to make this…hmmmm…like this is going to be tonight’s dinner! This look delicious ! But I wondered : Will any wine do it ? Is this : http://hipsterfood.eu/wp-content/uploads/2015/04/polenta2.jpg ; polenta grits ? I just tried this recipe and the Marsala sauce didn’t get syrupy at all. I found it really tarty too and I did follow the measurements. The only thing I did differently was replace portobella mushrooms with cremini because I couldn’t find any. Now, to be fair this was my first time making marsala, was it supposed to be tarty? Maybe I’m doing something wrong? This looks amazing!! Can’t wait to make it for my family! Thanks Anita! I hope you all enjoy it! I’ve been looking for more reasons to eat polenta!!! Thanks for the recipe!!! You could try vegetable broth. I made this for dinner last night. OMG it was amazing! Hubby went nuts on it and stuffed himself :). I added onions… something about onions and mushrooms…they go together so well. And ditzy me I forgot to get polenta at the store so I made mashed potatoes and I feel like it went well together. I could not find a marsala wine at the store so I ended up using that marsala “Cooking Wine” from the grocery store. I imagine the wine would have a more robust flavor. Is there another wine that I could sub next time? Cause this recipe is definitely a keeper. Hi, love your recipes! I’m currently working on a marsala sauce of my own, and I’m curious how you were able to verify the wine is vegan friendly. I searched Batrnivore for marsala, but didn’t find any results. Thanks! I wish I could remember what brand I used, but I don’t! If I remember correct, it was actually labeled vegan. Maybe if you scan some labels you’ll be able to find it (or another one). I googled around to see if I could figure it out, and Wegmans has a vegan cooking marsala. I’m pretty sure that’s not the one I used, but if you live near a Wegman’s it might be worth a shot. Marsala over polenta is so unique for me. Everything looks so harmonious. I am sure it tastes even better. Thank you very much for sharing the recipe, Alissa! This recipe looks amazing! I can’t wait to try it! What’s the difference b/w polenta grits & already made polenta? Can I opt for ready polenta? This turned out amazing! My sauce also did not really thicken so I added a bit of flour and that did the trick! Additionally I added a bit of white wine vinegar to balance out the marsala. 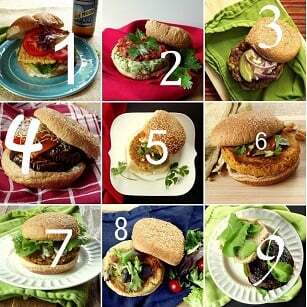 So savory and great depth of flavor- your recipes are becoming a Sunday tradition! Yay!! I’m glad you enjoyed it! Thanks Madeline! This recipe looks amazing. I usually do meal prep for the week-do you think it will store well in the fridge for a few days? If I double the recipe, is there anything I should be careful of? 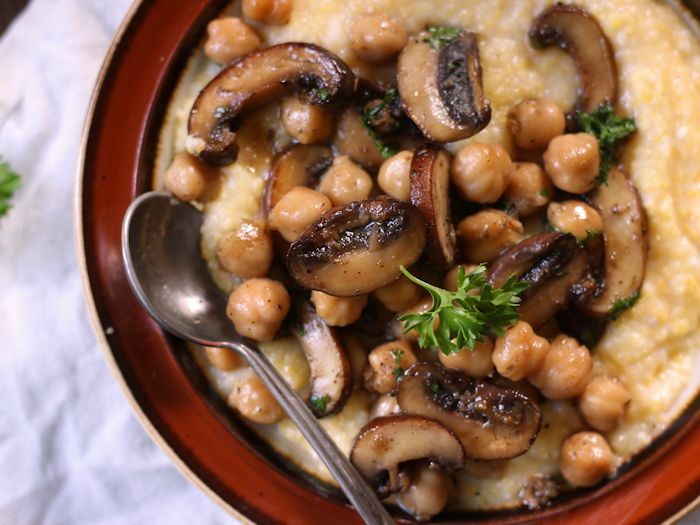 It should store well if you keep the polenta and the mushroom/chickpea marsala separate. 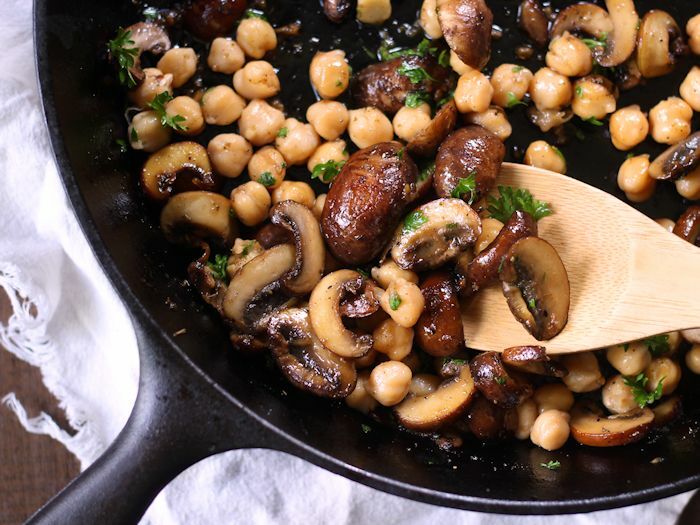 The only thing you might want to consider when doubling the recipe is cooking the mushrooms in batches – they don’t brown as well if they’re crowded in the skillet. That’s it! Enjoy! !